When I look back on my college days, I have very fond memories. I remember going to classes, and hanging on the quad with friends, as well as attending football and basketball games, concerts, and events. While I was very active in service organizations in high school, for some reason I didn’t really pursue it in college. I volunteered with my sorority, helped at a few campus-related events, and also took part in a number of unpaid internships, but service wasn’t a major component back in my day, at least for me. I do remember my university had a service club, but I never really explored it. However, over the last decade or so, I’ve noticed a transformation occurring in students and the universities they attend. Students are more focused on volunteering and universities are working hard to engage them, as well as provide them with opportunities to serve the surrounding community. Many schools now incorporate days of service with freshmen orientation or at the start of the school year. What a great way to get students involved with their school and the neighboring community. Let’s face it, a lot of young people who attend out of state schools never really get a chance to learn about the city they reside in for the next four years. Offering a day of service broadens their horizon and makes them realize there is a much bigger community just outside campus. Not only does the day of service provide young adults with an opportunity to learn more about the needs of their college town, but it can also help them develop a greater sense of pride and accomplishment from using their skills to help their community. In addition to introducing new students to the value of service, it’s a perfect way to get to know other people with similar interests. While I thought these campus-wide service events were a fairly new concept, I’ve learned otherwise. In the mid 1980’s, college students were sometimes portrayed as materialistic, self-absorbed, and more interested in making money than helping others. (Hmm, I did graduate in the mid-80’s!) However, a group of university presidents disagreed with this description and created Campus Compact, a coalition of college and university presidents committed to fulfilling the public purpose of education. They believed that many students on campus were involved in community service and more would participate if proper encouragement and supportive structures were provided. Boy, were they right. Colleges throughout the U.S. now have departments dedicated to engaging their students to perform public service with neighboring community partners. Take a look at any university’s club listing and you’ll also see a large number of student organizations dedicated just to service. Check out their calendar and you’ll find multiple volunteer events organized over the course of the school year, including campus-wide days of service where hundreds of students come together and share their time and talent throughout their city. For the past 20 years, Nazareth College has held their Orientation Day of Service program to educate new students about the school’s mission and tradition of community engagement and to encourage students to be active members of the community. The event brought together 550 volunteers who traveled to one of 25 service sites in the Rochester area and performed 1,650 service hours. The students also learned about the community’s challenges and resources and how they could give back by providing needed services. Of the 550 student volunteers, Lewandowski said 93% are expected to participate again in some form of service with their partner organizations, many of which also offer work-study or service-learning programs. 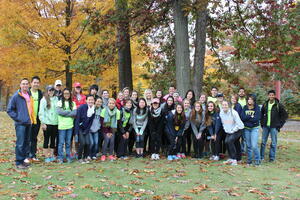 The George Washington University in Washington, D.C. held its 6th annual Freshman Day of Service in September. Students, faculty, and staff logged over 8,000 community service hours in one day! More than 2,400 freshmen worked alongside 44 local partners throughout the metropolitan D.C. area. Volunteers participated in community projects focusing on environmental sustainability, veterans’ affairs, community beautification, and healthy living. 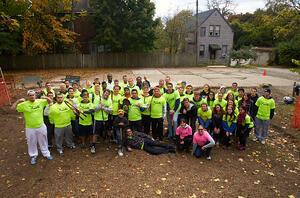 The goal was to introduce students to a variety of service opportunities. In 2012, the University of Pittsburgh implemented their Orientation Day of Service to start the school year off with service and have a positive impact on their community. “Each year we welcome hundreds of incoming students to participate in an afternoon of service to their community,” said Misti McKeehen, director of PittServes, a university-wide initiative to help build the culture of service within their campus and community. According to McKeehen, approximately 667 new students performed over 2,000 service hours for over 20 organizations before even stepping foot in the classroom! While students typically learn about the university and their new campus during orientation activities, the day of service provided an opportunity to also hear about their community. 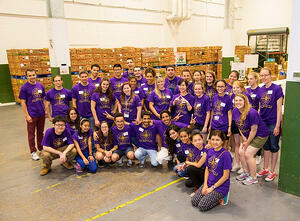 The University of Pittsburgh continues its’ mission of service throughout the school year. On October 18, they held their 7th annual Pitt Make A Difference Day, a University-wide service day held with 3,274 students serving over 115 organizations throughout southwestern Pennsylvania. Volunteers logged more than 13,000 hours in one day! This event also kicked-off the school’s first annual Make A Difference Month to highlight the school’s ongoing commitment to service. “We want to engage the students so they can see their impact,” said McKeehen, who hopes volunteers using NobleHour to track their service will log over 1,000 hours by the end of the month-long event. As an added incentive to participating, McKeehen said the student with the highest number of tracked hours will be able to make a service grant to the student organization of their choice. In addition, the student group with the highest average number of hours per member will also receive a grant to continue service. When students get together with friends to help with disaster relief, or volunteer at a shelter or food bank, they share that experience on Instagram, Facebook, and Twitter. All of a sudden, 500 people know about their positive experience and wish they had been a part of it or maybe they will want to participate next time. It’s like that old shampoo commercial – You tell two friends and then they’ll tell two friends and so on and so on. But now, it’s telling hundreds of friends and so on. According to Campus Connect, during the 2011-2012 academic year, 44% of students participated in some form of community engagement. These community engagement activities contributed to an estimated $9.7 billion in service to their communities. Let’s hope universities keep engaging their students and volunteers keep sharing their impact! Does your school have a campus-wide day of service? Tell us about the Noble Impact you’re making in your community.